On Sunday, February 26, the Administrator of the Patriarchal Parishes in the USA, His Grace Bishop John of Naro-Fominsk led the Divine Liturgy on Forgiveness Sunday in St. Nicholas Cathedral in New York City. On Saturday, February 25, the Feast of the Fathers Who Have Shown forth in Asceticism, Bishop John of Naro-Fominsk, Administrator of the Patriarchal Parishes in the USA celebrated the Divine Liturgy in St. Nicholas Cathedral in New York City. St. Innocent Church in Redford, MI was blessed to have Fr. Jerome Sanderson visit and speak on Saturday February 11th and Sunday, February 12th. Fr. Jerome gave two Pre-Lenten meditations entitled "Covering Your Brother's Sins," with a break in the middle for refreshments and fellowship in the church hall. 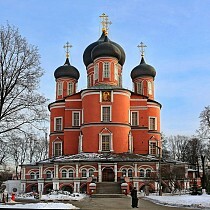 On Sunday, February 12, the Sunday of the Prodigal Son and the feast of the Synaxis of the Three Ecumenical Teachers, Basil the Great, Gregory the Theologian and John Chrysostom; the Administrator of the Patriarchal Parishes in the USA, His Grace Bishop John of Naro-Fominsk, led the Divine Liturgy in St. Nicholas Cathedral in New York City. 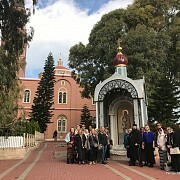 From January 31 - February 11, with the blessing of His Grace Bishop John of Naro-Fominsk, Administrator of the Patriarchal Parishes in the USA, the parishioners of St. Gregory the Theologian Church in Tampa, Florida led by parish rector Archpriest Andrey Kovalev performed a pilgrimage to the Holy Land. Starting in January 2017, Holy Trinity Church in Baltimore, MD installed a system for live broadcasting and subsequent archiving the divine services over the Internet. 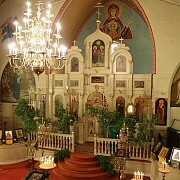 The parish will primarily broadcast Sunday Liturgies, services for the Great Feasts and the sermons of parish rector, Archpriest John Vass.